Snap a ceiling tile into small pieces to create a ragged edge. A single tile can yield enough rock for most model railroads. ©2012 Ryan C Kunkle, licensed to About.com, Inc. In the real world, rock formations come in every shape and size. Mother Nature seldom does the same thing twice. Fortunately for model railroaders, there are almost as many ways to model these rocks on our layouts. Rock can be carved from foam or plaster or poured into molds. Another fast, and often free, method involves using ceiling tiles. You've probably seen these around your office, or maybe in your own basement. 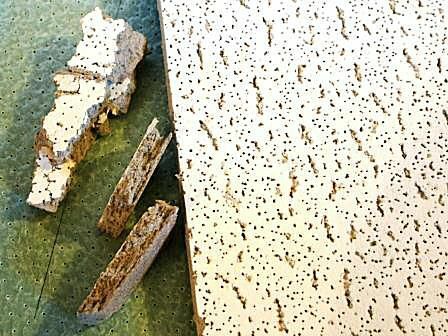 Hung from a suspended ceiling, these pressed fiberboard tiles are cheap, easy to cut and (fortunately for us) easy to break. Since we'll be breaking the tiles to make our rock, you may be able to procure a lifetime supply in a few broken tiles from the scrap bin. Modelers will spend hours studying photos of locomotives to determine details and weathering. Our scenery shouldn't be any different. The ceiling tile method is best suited for recreating stratified rock. Such an effect is often found in rock cuts along railroad tracks and highways. Layers of different minerals may even take on distinctive coloration. These colors are brilliant at first but can weather and dull over time. There is really no great science to making the rocks themselves. Just break the tile. Snapping or tearing chunks out of the ceiling tile will yield a jagged and irregular edge. The closer you hold the tile to the break, the tighter the grain will be. Break a pile of tiles and you'll have lots of material to work within the coming steps. The 1/2 inch thick tiles can be used individually or stacked to create taller strata. Rocks can be stacked and arranged in a variety of combinations to create a cliff or cut of any size. They can also be glued individually into a hilside to create an outcropping. ©2012 Ryan C Kunkle, licensed to About.com, Inc.
Once you've broken the tile into workable pieces, experiment with different combinations until you get the look you're after. To make the rocks fit in smaller spaces or against each other, they can be easily trimmed to any size with a sharp utility knife. If you want thin strips, it is easiest to snap a large piece and then trim it to size, rather than trying to snap very narrow pieces. Longer strips may cover more distance, but shorter blocks can be rearranged more easily. You can also stack rock at an angle. When you're happy with the results, glue the tiles together with yellow glue. A hot glue gun can also be used for faster drying. You can also glue a single rock into a hillside to create a small outcropping. A thick mix of drywall mud blends the tile rocks into the surroundeing scenery. ©2012 Ryan C Kunkle, licensed to About.com, Inc.
Now that you have a rock wall, it is time to make it look like it is part of the scenery, not sitting on top of it. To do this, mix a stiff plaster like that used in the final coating for hardshell scenery. A slow setting dry sheetrock (drywall) mix works well for making plasters for a variety of modeling applications. For this process, a thicker mixture - about the consistency of peanut butter - works best. You want the plaster to be thick, but not lumpy. Mix a little acrylic paint or dry powders into the mix to prevent a stark white plaster upon drying. This will prevent obvious chips down the road. Apply the stiff plaster around the rocks with whatever tools you have handy. Small putty knives, wooden sticks and of course your fingers all work well. Blend the top, bottom, and edges of the tiles into the surrounding scenery. You can also work the plaster into any large gaps you may have between tiles. The thicker you apply the plaster, the longer it will take to set. You should have plenty of time, however, to continue to carve and mold the plaster as it dries. A hobby knife will have no problem making changes to the hardened plaster as well. After painting, the rocks take added dimension and look nothing like the ceiling they came from!. ©2012 Ryan C Kunkle, licensed to About.com, Inc.
After the plaster has dried completely, it is time to paint. The most effective way to paint scenery is a three-stage process. Apply the paint in thin washes, like weathering rollingstock, and build the color gradually. Start with a base coat. A gray or brown works well and you can mix colors. Alternating colors in rows on the rock is a common sight in cuts. You can use acrylic or oil based paints on the tiles and plaster. If you've used foam for a scenic base, avoid oils as they can attack the foam. Once the base coat(s) have dried, add depth to the rocks with a wash of black. Allow the paint to settle into all of the cracks. Again, let the paint dry completely before adding the final touch. Finally, drybrush a little dull white or light gray paint over the high points to bring out all of the details. This three-level painting will help bring out all of the layers of the new rocks and can be used on plaster rocks as well as the tiles. Add ground cover to the scene and you're finished! These great rock walls can be made for practically nothing and in just a few evenings time. And most of that is just drying time!